Indigenous people have received treaty annuities in Canada for 200 years (1818-2018). These annuities are annual payments made to Indigenous people in fulfilment of treaties. They were promised for all time, are still paid now and will be paid in future. The amount is not indexed to inflation. 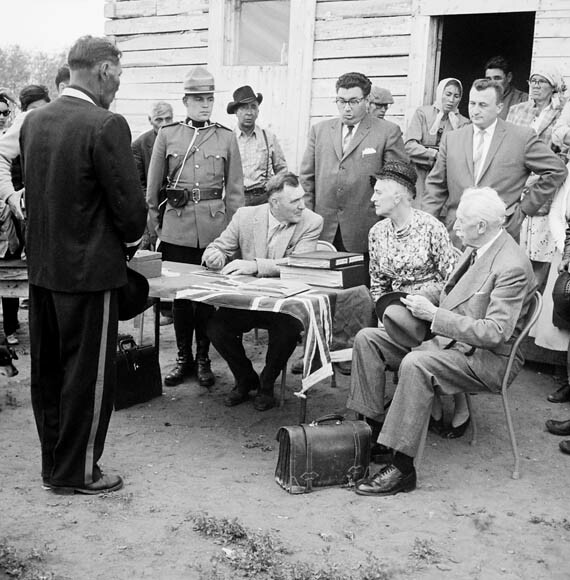 For example, this photo shows a Treaty 8 payment made in Fort Vermilion, Alberta. 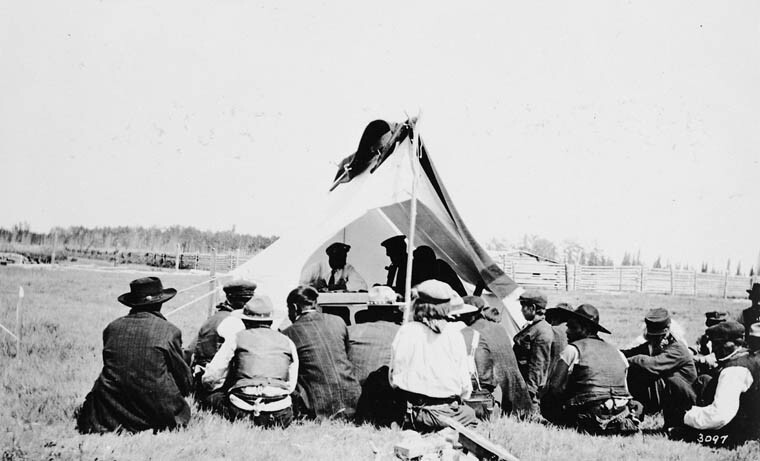 Treaty 8 (1899) promised $5 per person distributed each year, and Treaty 8 members continue to receive $5 per person today. Despite the small amount, treaty payments remain an important annual event, which begs the question—what is the ongoing meaning of treaty annuities? Historical records allow us to glimpse the intent and understanding of annuities when they were first introduced. While Claus didn’t say so, the Crown was likely financially motivated to avoid larger, one-time treaty payments. During this period, there was tremendous Imperial pressure to reduce the Indian Department’s annual expenses, as funded from Britain’s military budget. After the War of 1812 and the Treaty of Ghent (1815) the British foresaw lasting peace in North America, and wished to reduce military expenditures for Indigenous people. By 1818, there were frequent instructions from London to find means to reduce this cost. Surviving records of the November 5, 1818 treaty council report the Ojibwa Chiefs’ concerns regarding depletion of local game, continued hunting and fishing rights, and protection of islands for their use, but their reaction to the new system of annuity payments was not recorded. They may have been surprised, or potentially dismayed, at not receiving an upfront payment as had been the usual practice. However, the idea of an annual distribution was not a new one. Indigenous people in Upper Canada already engaged in a long-standing official distribution of annual presents as a means of Imperial diplomacy to express gratitude, and to ensure loyalty and military alliance of Indigenous allies with the Crown. After 1818, the treaty signatories simply received a further $10 worth of goods over and above their regular presents. Therefore, while treaty annuities were a departure in how treaties were paid, they mimicked a system already in place. More deeply, the system of annual presents drew on traditions of “material diplomacy” that the French and British had learned from Indigenous peoples. Early historical records abound with examples of material diplomacy—gift giving, exchange, feasting, and other tactile expressions of good will—, which colonial officials witnessed, reciprocated, and strategically assumed. Treaty annuities may be viewed within this context, as Indigenous people may have experienced annuity payments as material gestures according to their own diplomatic traditions, and the ways that the British already engaged with them. Compensation for land. For example, the Chiefs who negotiated Treaty 3 (1873) described the value of their land and its gold: “we have a rich country…where we stand upon is the Indians’ property, and belongs to them.” The Crown, they portrayed, should be prepared to pay generously for their territory. Contribution to economy. For example, a Chief negotiating Treaty 1 (1871) protested “that he could not live on ten shillings if he were to settle down.” Ultimately, this amount was negotiated from ten shillings ($2.40) to $3. The Treaty Commissioner described $3 per person as not enough to buy “winter necessities,” but enough for a family to “procure many comforts.” In practice, local prices were $1 for 20 pounds of flour, or 6 pounds of beef, or 4 pounds of tobacco, or 1 pound of tea. A large tin kettle cost $6. Promise of annual meetings. Annuities were (and are) paid annually and in person. Thus, annuities promised a regular opportunity to meet with the Crown. In particular examples—such as the Pembina Band, who initially refused payments for Treaty 1 (1871)—the meetings have also provided an opportunity to reject the Crown’s conduct in treaty. Betsey Baldwin teaches Indigenous history and public history at uOttawa. She is one of the co-owners of a historical research firm in Ottawa, Public History Inc. These were the Nottawasaga Purchase (Treaty 18) on October 17, 1818, which promised £1200 distributed annually; the Ajetance Purchase (Treaty 19) on October 28, 1818, which promised £522.10 distributed annually; and the Rice Lake Purchase (Treaty 20) on November 5, 1818, which promised £740 distributed annually. The latter was further clarified as $10 goods at Montreal price per person annually. Canada, Indian Treaties and Surrenders, Vol. 1 (republished by Saskatoon: Fifth House Publishers, 1992), 47-49. Minutes of November 5, 1818. LAC, RG 10, Vol. 790, pp. 7029-7032. This financial context is further expanded in: John F. Leslie and Betsey Baldwin, Indian treaty annuities: the historical evolution of government policy, from colonial times to Treaty 3 (Prepared for Research and Analysis Directorate, INAC, managed and edited by Erik Anderson, 2006). For example, see the nearby Simcoe Purchase (Treaty 17) on November 18, 1815, which had included a £4000 one-time payment. Indian Treaties and Surrenders, Vol. 1, pp. 43-45. The system of annual presents was also financially scrutinized, and discontinued after 1858. The Manitoban, October 18, 1873. The Manitoban, August 12, 1871. Simpson to Howe, November 3, 1871. Canada, Report of the Indian Branch, 1871, 31. Alexander Morris, The Treaties of Canada with the Indians (Toronto: Willing and Williamson, 1880), 46.